My recent forays into classic-era Doctor Who has been the six-episode The Talons of Weng-Chiang and the two-episode Attack of the Cybermen. The thought of SEVEN 22-ish-minute episodes filled me with a bit of dread. Would I see a bunch of back-and-forth dialogue? The Doctor being captured, breaking free, and being recaptured again? Long, sweeping shots of the English countryside? Well, I was pleasantly surprised to be proven wrong. Yes, there are some points that drag, and one of the central parts of the story don’t make any sense. 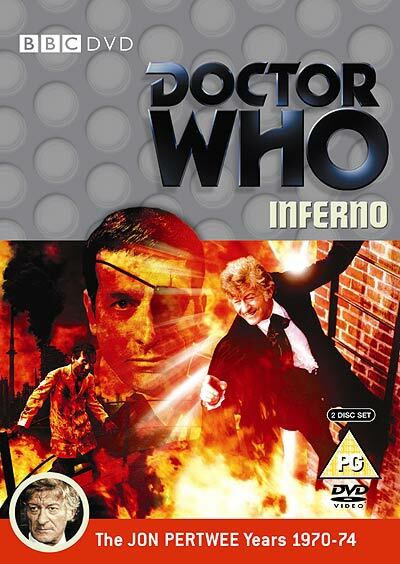 Still, Inferno is easily one of the Third Doctor’s best stories thanks to great performances and some strong action sequences, as well as an overwhelming sense of dread and hopelessness as one of the core rules of the show is broken…the Doctor loses. On this Earth, Stahlman’s project is about to reach its conclusion. But the penetration of the Earth’s crust leads to the release of a mysterious green goo that turns anyone it touches into a evolutionary throwback. As the Doctor realizes that the green goo has been released back on Earth, he also realizes that, unless he acts soon, this parallel Earth is doomed…and his “home” Earth is only moments away from taking the same steps that will also lead to its destruction! Inferno is really a seven-episode serial that consists of two separate but intertwining stories. Writer Don Houghton’s initial story concerned a massive borehole that released a primordial liquid that turned those who touched it into caveman. Terrance Dicks suggested that the story needed more of a plot to avoid being boring, and thus the big twist was introduced. I feel jealous towards those who saw this serial when it originally aired, as the Doctor’s arrival in a parallel universe was a surprise to those viewers! The portion of the story taking place in the “fascist Britain” universe consists of several very tense moments. The Doctor plays cat and mouse with several soldiers and Primords (the official name of the “cavemen” creatures, never mentioned IN the story of course) before being captured by Elizabeth Shaw and brought before the Brigadier Leader. While this is happening and the Doctor is being interrogated, Stahlman’s project is nearly completion, and the script bounces back and forth between the the Doctor’s situation and the drilling project, where Stahlman, infected by the green goo and slowly becoming inhuman, insists the project continue and Greg Sutton, a drilling expert who refuses to be intimidated by the regime, insist it be brought to a halt, with Stahlman’s assistant caught in the middle. Back on Earth, as opposed to the Brigadier Leader’s determination to drive the project forward regardless of the death and consequences, the Brigadier is determined to halt the project, no matter what delays Stalhman places in his way. The story of the drilling project fills the first two episode with enough action with the Primords and shouting via Stahlman and Sutton that it doesn’t start to drag. In the episodes where the Doctor finds himself in the parallel universe, the story will cut back to the “normal” Earth to remind the viewer what’s going on by pushing the story forward enough that, when the Doctor makes his return, the pieces are in place for the final episode. In a way, the final episode is kind of anti-climatic, especially compared to the fast paced tension of the previous episodes. The padding does come in the alternate universe, as there are a few extraneous “capture/escape/caught” sequences. But they’re very well done, as we get to see Jon Pertwee’s Doctor in “James Bond” mode, both in terms of physical prowess (and charm, in the polite way he knocks out the guard escorting him) and as gadgeteer as he does his best to at first fix the project’s computer (which has been sabotaged by Stahlman because the data it produced would have caused the project to be should down) and then as he quickly tries to fix the console so he can escape the dying world and save his adopted home world. Seeing the Doctor realize that, no matter what he does, he can’t save the parallel Earth, will come as a shock to most viewers. This works to the story’s benefit. The Doctor isn’t concerned with “fixing” the fascist world he finds himself in, and the viewer is never told what the course of historical events was that brought about the new republic. The focus is on the characters and the situation. Each major and minor character on Earth has their counterpart in the parallel world, and they’re not played with a sense mustache twirling, black hat wearing evil. They’re people who could have, under the guise of a totalitarian regime, ended up where they ended up. Stahlman, with the complete backing of the regime, will see his project finished no matter what the cost. Sutton, loud and in-your-face, telling the regime that it doesn’t matter what they do to him if they’re all going to die anyway. Benton, the loyal soldier who acts out of a sense of jackbooted superiority as opposed to faith in the system. Elizabeth Shaw, who chose science over security. And the Brigadier, still firm, still in charge, but now with total authority to decide his actions as opposed to years of military experience. The characters are all still familiar to the viewer, but just different enough to be…wrong and off putting. On the other hand, the origin of the green goo that turns normal people into the savage Primords is summed as “weird liquid that comes from a hole in the ground that turns people into cavemen.” And that’s it. 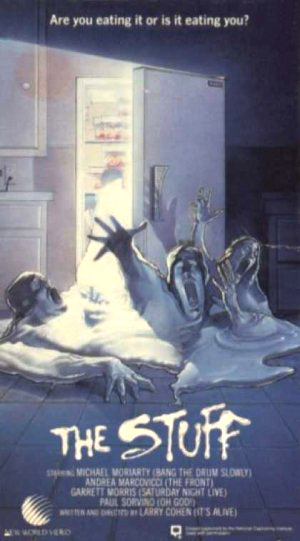 It’s the same explanation the classic 80’s B-movie The Stuff used with regards to “ice cream that turned people into zombies,” but THAT movie gave us a bit more background. The goo is the ultimate MacGuffin and could have used an explanation or an origin of some sort. Mentioning The Stuff solely to make this segue, there are a lot of horror motifs in this story. As the world slowly burns thanks to the penetration of the Earth’s crust, a red filter is applied to the camera during the outdoors scenes. The Primords look a bit silly, but the way they act and move could have come from one of the Hammer movies, or even a Quatermass story. And the cliffhanger at the end of episode six is one of the best classic Who has ever done. The Earth screams and doom rushes towards the Doctor as he tries to escape while those who he can’t help, even those who were trying to kill him just minutes earlier, are helpless in the face of their own death. I would recommend anyone interested in the Third Doctor, after watching Spearhead from Space, to roll right into this story after passing through the other episode from this season: The Silurians and The Ambassadors of Death. Doctor Who rarely does “parallel universe” stories (I think the only other televised one is Rise of the Cybermen/The Age of Steel) and this one does the concept right, giving us the Third Doctor with his charm, knowledge, and strength even as he faces off against familiar faces in an unfamiliar land. This entry was posted in Random Thoughts and tagged Brigadier, Caroline John, Doctor Who, Doctor Who Review, Jon Pertwee, Liz Shaw, Nicholas Courtney, Third Doctor. Bookmark the permalink.